Pilchards are a soft bait when fully thawed out and to some can be very hard to keep on the hook. The main two things I will say about rigging a half pilchard is to make sure the hook point is out and use a double half hitch around the tail. The rigging technique outlined in this article should prevent excessive spinning of the bait and keep your hooks in the bait for as long as possible. Firstly, cut the pilchard in half at about a 45 degree angle. Insert the hook through the skin so that the bend of the hook is up against the spine of the bait. The hook point should now be facing toward the tail. Lay the shaft of the hook parrell to the back bone. Place two half hitches around the tail, making sure that the half hitches are above the eye of hook. You should be left with a perfectly presented pilchard. Mulloway can’t seem to resist a well presented half pilchard. You could also use the top half of the pilchard by substituting the half hitch around the tail by passing the hook through the eye twice. When you are next using a half pilchard try the following technique to get fewer snags when fishing amongst the mangroves, over cockle beds or broken rubble and off the beach or rocks. When the bait is rigged this way it can be used when the ball or bean sinker slides directly down onto the bait, a paternoster rig or when the sinker slides down onto the swivel and you have a leader length of a metre or more. 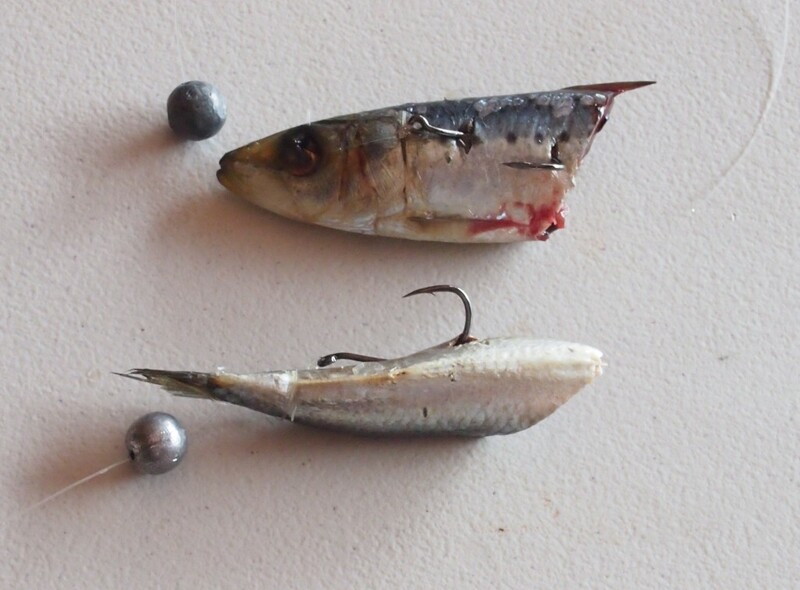 This same rigging technique can be used when using the tail end of a garfish, frog mouth pilchard on a whole white bait. This will allow the bait to float around in the wash or current and not get snagged up as much. 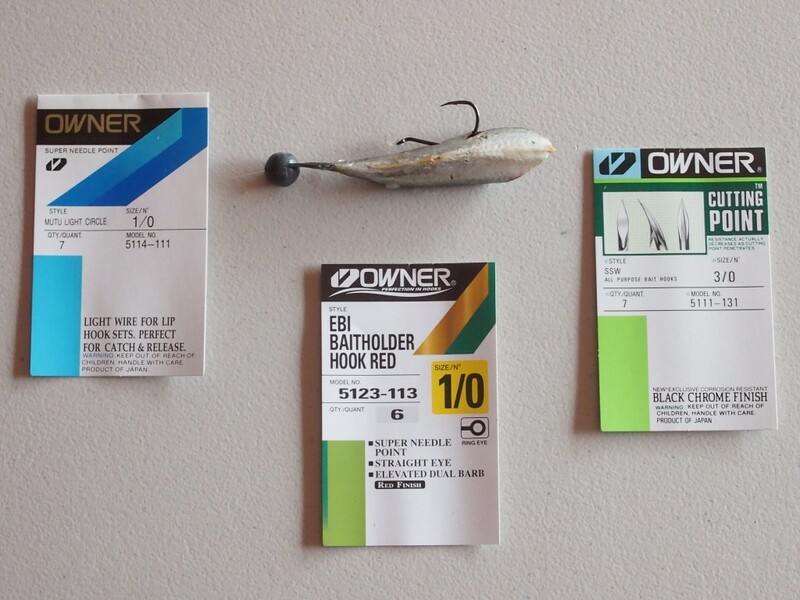 So where you are casting from the shore, drifting in a boat or at anchor the half hitched rigged bait is an extremely effective way of reducing line twist and snagging. 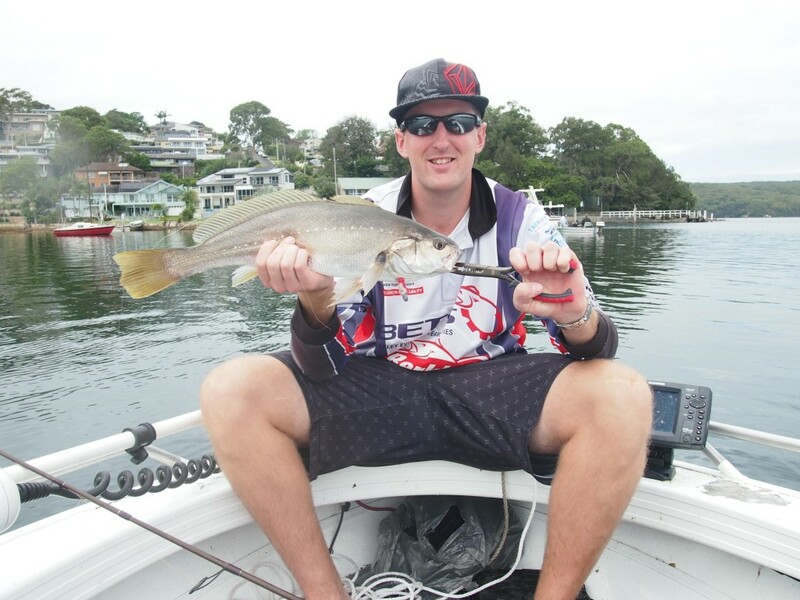 Hook styles that could be use are Owner Mutu Light Circle, SSW Cutting Point & EBI Baitholder Hooks when fishing for bream, flathead, mulloway, trevally, snapper and many other saltwater fish species. Make sure the hook point and barb are protruding out of the bait.